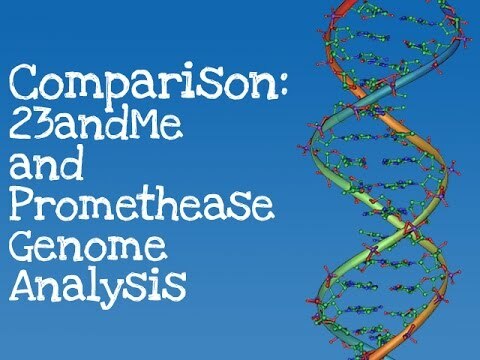 This video compares the aesthetic and functional aspects of 23andMe and Promethease test reports. It focuses primarily on layout and information provided, without getting bogged down in comparing exactly how these services come to different conclusions (although that is evident). One thing I’ve noticed from using these two different services is the difference in transparency and access to information. While 23andMe make a concerted effort to minimise clutter and make their reports interactive and easily-interpreted, Promethease focus on providing information, citations and the tools that allow users to look deeper and come to their own conclusions. Have you used either 23andMe or Promethease? How do you think these two different services compare? Leave a comment below! I had my DNA checked by both Living DNA and a year later by My Heritage, Living DNA was pretty spot on as I know a lot about my family Geology but My Heritage missed out my massive Scottishness, born and bred to a whole massive line of Scottish born ancestors back to 1600s, they had me ZERO Scottish,Irish,Welsh, and 36% English and though I had some Scottish ancestors moved down south from my Mother's side I was at least 99.5% Scottish. on my father's side I have German Heritage and have traced many of my Germany ancestors back to 1600s in Prussia which I knew about. I do not fault My Heritage on their collection of documents, I traced many of my family mostly in Scotland and in Germany and no, I'm not adopted as I've very much my Scottish Mother's daughter in closeness of how we look etc and I have my 62 year old birth certificate. The fact I'm well aware that in the US and other countries they are under the belief that Scotland is part of England and England is the UK and I am a very proud Scot so was deeply offended that they maintained I did not have any Scottish DNA. It seems 23 and Me have the same problem, that I would be seen as British, even English like the mistake My Heritage made, I even doubt if the result I received were even mine, how can Living DNA get it so right and My Heritage so wrong, I eventually got a refund! At the time I felt lost, being told that my DNA had no Scottish in it though I'm predominately Scottish was really upsetting, I doubted myself, my family but in the end, I knew it was their mistake, whether it was intentional con or not I wish people who run these sites for DNA testing would stop pretending Scotland doesn't exist to those who are born and brought up there to a massive Scottish ancestry, it seems if you are an American, you can have Scottish ancestry but not if you have lived all your live as a Scot in Scotland. It short changes the Nations who are actual countries and NOT an extension of England nor is it British, my ancestry goes back to when Britain never existed so most Scots would appreciate actually being seen as born in their own country Scotland and not as part of Britain or England….all it does is rob us of our identity. A Good example of this is my inability to link to your account: "THE FEATURE IS NO LONGER AVAILABLE." 1)finding out information about my biological father (whom I never met) and do not know anything about, as my mother never said a word about him. i only found out with paternal testing. 2) the other issue, finding out more about my mothers maternal line. Her mother did not have a birth certificate and from photos did not look much like her father. There really are no photos of her mother and her maternal surname has no history. Nothing on Ancestry, 23andme, etc. on the new 23andme I see some possible relatives, who might be able to give me some answers, but they do not share and as of now do not want to. In that case, they are worthless data to me. upsetting because i really do not care about them, i am interested in the bigger picture. only 99.9% european? you mutt, i am 100%. A brit that is only 30% british and irish? wtf man, my ancestors left the isles in 1816 and I am 77% british and irish. Very useful, thanks for uploading. Can you print these reports in one long file rather then the website formated? Would be great to have for my personal records, but with the cost jumping to $200 I want to make sure it's worth it. I am very new at this and tested on the genesforgood research app as 100% European. It is identical to the 23 and me apps and s I am going to see if promeathse can sort me out. obtained my raw geonome Looking strickly at my genealogy I am allegedly related to the royal houses of europe on my Dad's Maternal side, and Irish royalty on my Ma's Paternal side. Go figure. anyway great instructions and I am gonna spend my $5 on Amazon.com to send me this report I should get in about a 1/2 an hour And now I can do as I wish figuring out what disease I am most likely to kick the bucket with. Will it be Alz like my Daddy and apparenty my Ma (Who both lived into their 90s) or will it be the HLAB-27+ problem which takes 18 years off one's life like my maternal gma who died at 40 of childbirth while cooking on up dinner. Thanks for the excellant discruptions Thanks again. You Rock, Flannagan. Great video! Thanks for walking me through the layout of 23andme. I wanted a good glance at what to expect before I purchased it. You forgot to check out the "countries of ancestry" tab. You can find some neat stuff in there. Great coverage though. Waiting 6-8 weeks for my results. Thanks. I'm using this to help explain for relatives and advanced paper genealogists interested in adding DNA tools. Did you originally get your 23andMe results recently? I've been hearing a bit about the issues related to the FDA and now their reports are more limited. Can you comment on this? Your results seemed to have very detailed info (likelihood of lactose intolerance, alcohol flush, curl tongue, etc). As far as I understand, 23andme does not analyse the Y-chromosome for males. Would you be so kind to tell me if I am wrong? Thank you! Did you get the genetic risk factors before the FDA made 23andme stop giving it out or did 23andme start providing that information again?